Many old-time enthusiasts in Ireland (not to mention visitors from abroad) attended fiddle or banjo workshops given by Erynn Marshall and Dan Levenson in February this year during the First Annual Irish Old Time Appalachian Music Gathering in Lisdoonvarna, Co. Clare. For those who would be glad to see, hear, and learn from them again, the FOAOTMAD news blog announces that both of them will be in Britain in November, giving two workshop weekends together. The beginner/ improver workshops will be held at the Wye Valley youth hostel at Goodrich, near Ross-on-Wye, Herefordshire HR69 6JJ, on the weekend 16-18 Nov. 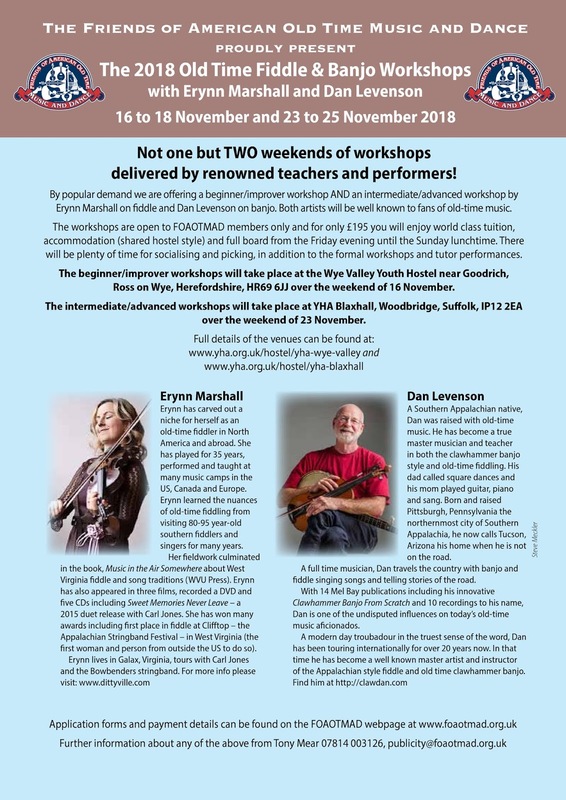 The intermediate/ advanced workshops will be held at YHA Blaxhall, Woodbridge, Suffolk IP12 2EA, on the weekend 23-5 Nov. All details are on the poster image, which appears larger on the FOAOTMAD blog. No information on any other appearances in these islands is at present on their online schedules.